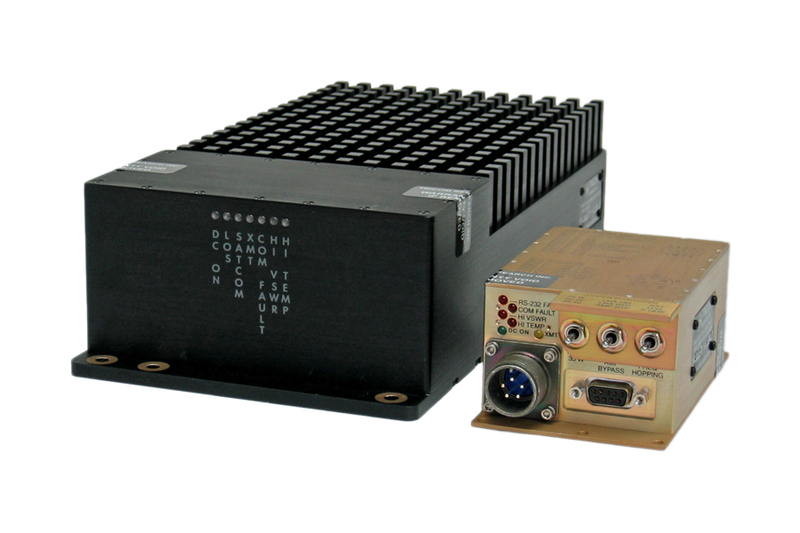 Amplifiers — Tricom Research, Inc.
State of the art software defined RF Amplifier designed to extend the range of modern handheld and manpack Transceivers. Supports emerging Wideband Networking Waveforms including SRW and ANW2, as well as legacy Narrowband Waveforms such as IW, DAMA, SINCGARS and HAVEQUICK. Each amplifier and Bias Tee 2 combination is shipped with one four foot DC power cable. The power cable is only shipped when the amplifier and Bias Tee 2 are ordered together. The DC cable can be purchased separately if needed using Tricom Part Number 1035-77200-00006. Operation is simple and straightforward and all performance specifications are identical to the Bias Tee 2 equipped system including electrical, environmental, and physical mounting. Amplifies transmit signals to improve signal margin in noisy environments and/or sub-optimal antenna patterns. NOT SURE WHICH TRICOM RESEARCH AMPLIFIER BEST SUITS YOUR APPLICATION?